In this confection of a restaurant, Il Cielo presents a wondrously elegant and stunningly romantic setting that is sure to bewitch even the most cosmopolitan of patrons. Owner and Executive Chef Pasquale Vericella has meticulously created a destination restaurant where guests can bask in the charms of Il Cielo’s visual beauty and revel in its exquisite Northern Italian cuisine. Nestled in a residential area of fabled Beverly Hills a couple miles east of Rodeo Drive, Il Cielo beguiles guests with a captivating romantic beauty created by its casually elegant décor, twinkling lights, and lush foliage. At Il Ceilo, Executive Chef and Owner Pasquale Vericella takes great pride in offering patrons a Tuscan Italian restaurant experience based on quality cuisine and excellent service in a convivial, yet intimate setting. 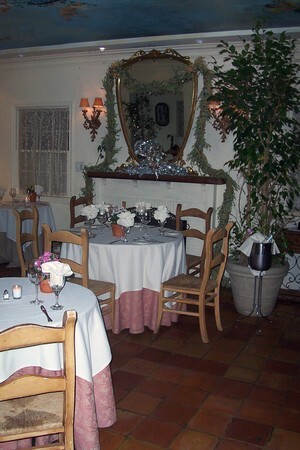 Celebrating its 21st anniversary in 2007, the restaurant has long been a welcoming destination for both intimate assignations and gala gatherings, offering a cuisine that reflects Vericella’s Northern Italian heritage and family tradition of celebrating life through food. Located along the eastern boundary of Beverly Hills away from the city’s main restaurant areas, Il Cielo is situated along a bustling boulevard among multiplex residences and condos. It resides in an old building, which retains some of the structural elements from its 1938 origins as a family residence and business. That business, interestingly, had been a hair salon catering to Hollywood stars and starlets, one of whom was rumored to be Marilyn Monroe. The intimacy of a home remains at the heart of Il Cielo. The restaurant’s jewel-like setting features several interior and exterior rooms, each personally designed by Vericella in a country Italian theme that sparkles like the twinkling lights and candles that illuminate the restaurant. It was this tranquil beauty that greeted us the weekday night we dined. Closing the restaurant’s wrought iron entrance gate behind us, we shut out the world. The noise from busy traffic vanished from our minds as we gazed around the restaurant. Before us, a few yards ahead, the interior entrance to Il Cielo welcomed us with glittering candlelight. Yet, to our left, the patio beckoned, and we got no further. Tiled in weathered brick, set with elegantly clothed tables spaced well apart and accented by potted plants, the patio was irresistible. Glancing up, we were delighted to see multiple swaths of gauzy fabric running outward from the patio’s central chandelier to the room’s perimeter. We also noticed an indiscernible clear canopy, a great feature that allows diners to enjoy the patio regardless of the weather, even a rare Los Angeles rainstorm. Adorning each table were votive candles that emitted a soft luminescence. With contemporary music resonating in the background, all the elements for a delightful evening converged into this one space. 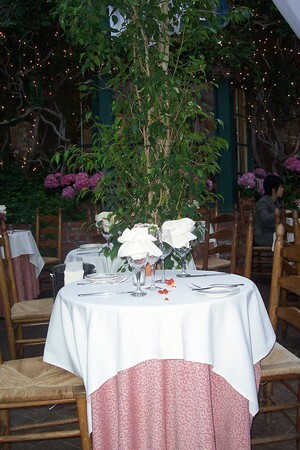 We selected a table along the patio’s perimeter so we could gaze at the surrounding beauty and enjoy the scene. Il Cielo’s general manager Massimo Mazzarini approached our table and introduced himself. After discovering that Mazzarini hand-selects Il Cielo’s wines, we asked for his guidance with our evening’s wine selection. We chose an Italian white wine, Greco di Tufo Marianna Campania. Dry with a slight mineral taste and citrus overtones, it was one of the most delicious white wines I’d ever tasted. We were informed that the wine was one seldom offered by other restaurants. A traditional Italian meal is not complete without a plate of antipasto. While not exactly in Rome, we chose to live the motto, so we started off with Il Cielo’s antipasto for two. The selection was a meal unto itself. Served on a large platter, the dish included salami, prosciutto, two kinds of bruschetta, and burrata with tomatoes. The challenge was where to start? The meats were lean with a slight salty tang. Rather than the more commonly seen bruschetta with tomatoes, Il Cielo’s version came topped with fresh pesto and olive tapenade on crisply toasted ciabatta bread. The burrata, served with a sprinkling of toasted oregano on top, was soft and creamy and paired well with the ripe red tomatoes. Toasting the oregano had resulted in intensifying the spice’s bite, making it a perfect foil to the buttery texture of the burrata. The antipasto’s grilled eggplant and peppers were prepared with a trace of olive oil allowing for the fresh vegetable texture and taste to shine. Next up, pasta then more pasta! Our primo piatto (first plate) of Schilatielli Sorrentini pasta with truffle sauce was served first. Steamy and aromatic upon presentation with a smattering of toasted breadcrumbs for crunch, the schilatielli (a thicker and shorter version of spaghetti) made a perfect base for the rich and creamy sauce. Infused throughout the pasta, shaved truffles lent a mellow earthy flavor. Italian ambrosia popped into my mind as I savored the dish. Our appetites and expectations now whetted, we eagerly greeted our next offering, Risotto con Funghi Porcini. Garnished with parsley, the risotto had a slightly woodsy flavor from the mushrooms, which was a perfect follow-up to the hearty pasta. A soupcon of truffle oil permeated the risotto adding pungency and depth and complementing the slight bite derived from freshly grated parmesan. Ravioli stuffed with spinach and ricotta with marinara sauce then made its appearance as our final primo piatto. A deceptively simple dish made divine, the spinach stuffed ravioli was not overwhelmed by the sauce. Rather, the fresh, tomato-y marina was so light and delicately flavored it allowed the pungent spinach a co-starring role. Good thing we had eaten sparingly earlier in the day as we could share our secondi of Branzino Tradizionale alla Griglia and Bistecca alla Griglia with each other. By then we were also ready for more wine, so we chose a red Valpolicella Rupasso “Baby Amarone.” Smooth, deeply flavored, but not too heavy, it was a perfect wine pairing for both entrées. I had selected the branzino, a blue-nosed sea bass. It had been broiled under a salamander resulting in a crispy brown exterior skin and moist, fleshy interior. Atop the fish was a plump shallot, translucent from roasting, a meltingly delicious accompaniment to the sea bass. Sautéed rapini prepared with chopped tomato, capers and olives served as the dish’s foundation. Depending upon the forkful, I tasted either tart caper or tangy olive along with the tender, flaky fish. My partner had chosen the bistecca, a succulent filet of beef capped with a Borola wine reduction sauce. The dish was a deceptively simple presentation of the filet partnered with sautéed spinach alongside sliced roasted potato. 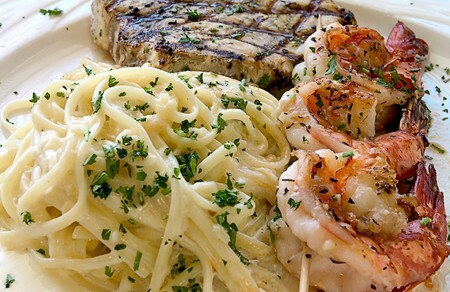 The reduction sauce’s sweetly flavored richness enhanced the hearty meat and also paired well with the sides. The spinach was whole leaf, rather than chopped, releasing the full flavor of the vegetable, which stood up well to the garlic and olive of the sauté. The potatoes were crispy-edged and flavored with savory sage. This was a classic dish in a rendering that allowed for integrity of flavor from each main ingredient that didn’t overpower the other. With such a delightful meal, we couldn’t resist completing our fine dinner with dessert. We selected Semifreddo Mieli and Pane Cotta after some careful deliberation. Each was smoothly creamy and slightly rich with a perfect intensity of sweetness. Imbedded in the semifreddo were crunchy pistachio nuts, a pleasing contrast to the smoothness of the mousse. Additionally, the dessert included a dollop of intense pumpkin gelato which proved irresistibly delicious. The pane cotta came impressively presented within a circle of edible rose petals garnishing the plate. It was almost too beautiful to eat! Never having tasted rose petals, I was curious to try. Crunchy, sweetly encrusted with sugar, the petals were small candies that melted on the tongue exuding a delicacy of flavor. They paired well with the pana cotta’s vanilla-infused creaminess. The evening had now come to a close, but before leaving Il Cielo, I took a final opportunity to wander around the restaurant so as to visit other rooms. Strolling around, I was captivated by the unique way each room displayed distinctive features and perspectives, yet communicated a consistent feel of cozy elegance and romance. The main dining room, off the central hallway, featured a beautiful central fireplace crowned by a lovely gilt-framed mirror. Opposite the main dining room and set a little farther back into the restaurant was a smaller dining room that sparkled from its mirror-paneled wall on the interior side. Its other main feature was a series of French doors along the far wall. These doors led out to the terra cotta-tiled garden patio. I learned upon inquiry that the French doors could be opened and removed to accommodate parties who require both rooms. The patio was a sizeable space big enough for a large party and a multitude of different table arrangements. The room’s far wall was stuccoed and embedded with half columns. The patio resonated with a Romanesque ambience through its frescoes and architectural details. Perfecting the setting was a clear canopy revealing the twinkling stars overhead. My tour completed and our dinner ended, it was time to return home. I felt that our experience had not only been a fine meal, but a journey to another destination where life was celebrated and cares forgotten. Il Ceilo was certainly a destination worth a return visit. Main Dining Room | Lunch 10:30 a.m. - 3 p.m. Located in famous Beverly Hills, Il Cielo is within convenient range of a number of Los Angeles attractions like Rodeo Drive. Yes. You may email the restaurant at [email protected], or call 310-276-9990. Vine ripened tomato stuffed with shrimp and marinated artichoke accompanied with arugula and a whole grain mustard sauce. Salami, prosciutto, bruschetta al pesto, grilled eggplant, roasted bell pepper, sliced tomatoes, mozzarella and olive oil. Serves two. Braised Belgian endive salad, orange segments, candied walnuts and gorgonzola chees. Crisp calamari with marinara sauce. Caesar salad with toasted ciabatta bread, diced tomatoes and shaved Parmigiano Reggiano. Imported durum wheat spaghetti with spicy Italian peppers, cherry tomatoes and garlic confit. Homemade scialatielli with whole Maine lobster and fresh cherry tomato sauce. Grilled Hawaiian blue prawns on a frisee lettuce salad and lime citronette. Grilled whole striped sea bass with fresh herbs served with vegetables and parsley sauce. Norwegian salmon with sauteed bell peppers, grilled eggplant. Chicken breast served with paveed potatoes, sauteed spinach in a porcini mushroom sauce. 22 oz. bone-in rib-eye grilled served with rapini and wine must. New Zealand lamb chops with sweet potato, petit red onion, baby carrot and wine sauce. Clams, calamari, Hawaiian blue prawns, mussels, and white fish served with a light spicy tomato broth. Il Cielo signature dessert. Serves two. Heart-shaped flourless chocolate cake with chocolate mousse and fresh raspberry layer wrapped in rich dark Belgian chocolate. Served on a silver platter. Il Cielo signature dessert. Chocolate souffle served with vanilla and pistachio gelato. 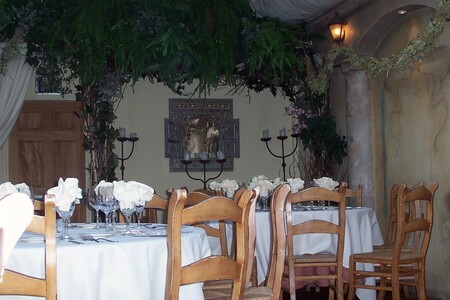 Il Cielo was the perfect place for us to hold our wedding. It was private, intimate and just what we wanted. Pasquale, the owner, and all his staff were very helpful in planning our wedding. Pasquale even made our cake and it was divine!! The food and service were outstanding. All our guests had a great time. We cannot thank Pasquale and his staff enough for helping make our wedding such a memorable occasion. 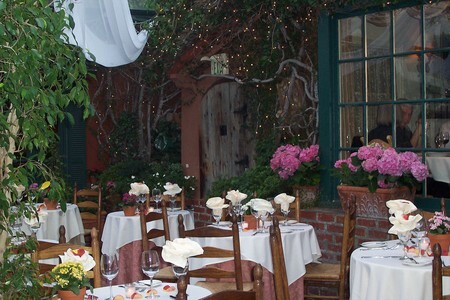 After holding our wedding at Il Cielo it is easy to see why it is listed in the top 7 places for weddings in LA. We returned to Il Cielo to celebrate our 5th wedding anniversary and the food and service was still as good as we remembered. This year we celebrate 12 years and we look forward to returning to Il Cielo to celebrate the event. I LIKE IT . I WAS THERE TWICE . I'LL GO BACK AGAIN . Bad Customer Service ~ Not Professionals!! Booked wedding aprox 4 months ahead. Constant chaos with the "Event Planner", multiple items forgotten or not addressed, no call backs. Aprox 1 week before our wedding a family emergency caused us to cancel the event. Even the the terms of the contract stated we were entitled to at least 70% back, the owner Pasquale kept OVER $20,000, and refused ANY refund. I strongly recommend NOT booking ANY events at this restaurant, unless you want to get burned!